Can someone forcibly take your gun? 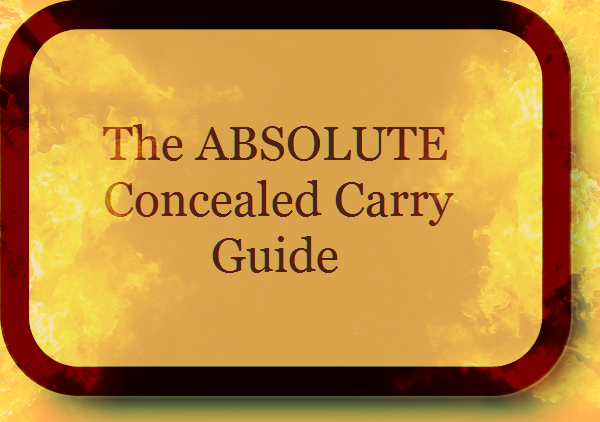 Learn how defensible each holster is now! Home Defense: Guard Dog or Gun? Best Biometric Gun Safes: Which one is the best value for your money? Law enforcement officers generally take concern with an individual who has a gun on their person. That’s not to say that all cops are “hot-headed”, nor is it accurate to claim they’ll treat you any differently – you just have to know how to engage with them in a calm, professional and clearly understood way. Understanding is the #1 preventer of escalated force. Listen to their instructions, and you’ll be fine. Make no movements and take no actions that could be confused with dangerous intent, and you’ll be safe. Letting them know that you have a gun on your person, however, requires a bit more consideration. 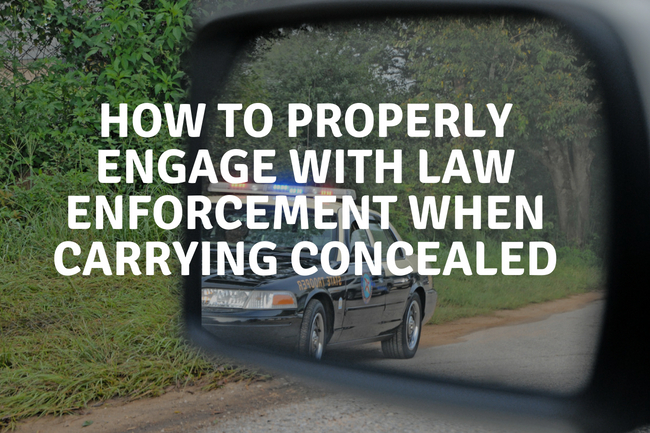 With that in mind, let’s get into the tips, dos, and don’ts of interacting with law enforcement while you have your carry weapon on your person or in your vehicle. This one’s common sense, folks, but we still need to address it. You should never attempt to grab your carry gun, be it on your person or in your vehicle, when you’re interacting with law enforcement. Even if your interaction’s going well (a casual conversation at a DUI checkpoint and you’re under no suspicion) any indication that you’re reaching for a weapon could land you in handcuffs – or often, much worse. We’ll get into how to actually announce the presence of your handgun, but even when you’re telling the LEO about its existence, do not simultaneously reach for it. It’s human nature for us to grab at an object we’re talking about if it’s within our reach. Don’t do it in this environment. In rare instances, the LEO you’re interacting with may request that you present your firearm. If you’re instructed to do this, do it slowly and without performing any other actions at that same moment. For example, if you’re in a vehicle you shouldn’t undo your seatbelt, climb over your seat, or make it appear as though you’re getting ready to get out of your vehicle. If you’re out of your vehicle or traveling on foot and your weapon is not on your person, tell them it is in a container – whether it’s a backpack, purse, or suitcase. If you have to make any extra movements to grab your weapon, let him or her know so they’re not surprised or concerned. This one’s simple: Tell them you’re carrying every single time and as soon as possible. Never hide the fact you’re carrying a handgun on your person or in your vehicle. Some states have a duty to inform, meaning you’re legally required to tell them – but some do not. Even if you have no duty to inform, you should. Picture this: If that LEO finds out on his or her own, do you think they’ll “be cool” about it? Or do you think they’ll believe you have a reason not to tell them in honesty? We’re sure you can guess the answer: It’ll likely land you in handcuffs or quickly escalate the situation – usually that means in a barrel in your face and more red and blue lights flashing about you. By now you may have realized there’s a lot more to consider with this, huh? So how do you tell a cop you’re carrying a deadly weapon? Simple, do it calmly and plainly the moment you make contact. Most LEO interactions occur at traffic stops, so let’s consider the scenario. Again, do not make any movements. Your vehicle’s dome light should be, you should be making eye contact, and your hands should be on your steering wheel. Their next question will likely be, “where is your weapon?” Tell them, but do not reach for it. They may ask what condition it’s in. That means whether it’s unloaded, loaded, chambered, off safe or on safe. For your safety and for the sake of your interaction going smoothly, always ensure your weapon’s in a safe condition. We strongly recommend keeping your weapon on safe, whether chambered or not. Sure, your handgun might have all the modern features that prevent negligent discharges at Condition Zero (chambered with safety off), but the apprehension level for that law enforcement officer goes up exponentially with every condition of readiness that your handgun is at. Even if you’re being detained or suspected of a crime, even if you’re carrying illegally, announcing the presence of your handgun will let that LEO know that you’re being honest and thinking about your and his or her safety. Yes, carrying illegally or improperly (carrying JHPs for self-defense is illegal in New Jersey, for example) can result in a big fine and jail time, but the chances of you skipping a night (or even months or years) in lock-up gets much better if you tell them before they find out on their own. The moment you’re stopped or detained, that cop has the right – or can easily obtain the right – to search you and your vehicle. A Supreme Court case, Terry V. Ohio, held that LEOs have the right to perform a frisk or search if they reasonably believe you’re armed. They may even legally, temporarily disarm you for their safety. The chance is very likely that they will find out you’re carrying. With this in mind, be proactive. Present your CCW License or Permit with your driver’s license, registration, and proof of insurance. Don’t just hand your License or Permit to them, tell them you are. If that LEO walks away not realizing he or she is holding your CCW license, the moment they do realize, they’re going to consider the fact that you did not announce that to them. They’re also going to consider the fact that they just left you alone, possibly with a deadly weapon that did they not know about. Even if you’re a CCW License holder but you have no weapon with you, tell them you’re licensed. It’s highly likely their database will tell them you’re a Licensee either way – they have to assume you’re carrying. Even if you’re not carrying so you didn’t tell them, those same concerns can become apparent. Here’s a piece that law enforcement may not want to admit. While we greatly respect them, we have to address it: They’re humans, they have emotions and opinions, and they make mistakes. Most cops are great, a minority of them are not. Some hate the fact that civilians can carry concealed – usually because they feel it constitutes a threat to their safety or authority. No matter how the LEO you’re interacting with acts, you must be polite, courteous and calm. Here’s where that polite, courteous and calm thing can get tough: Some officers may feel they have a duty to disarm you the moment you announce you’re carrying. They do this for their perceived safety – even though simple logic would say that you’re being honest and abiding the law, so you’re probably not going to do anything stupid. Do as they say. Attempting to refuse to hand over your handgun is worse than refusing to hand over illegal substances. Your prize will probably be a gun in your face, handcuffs, and possible charges. Some cops are just rude. It’s not necessarily anything personal, they just don’t want to give off an impression of complacency or naivety. They want you to know they’re not your friend and they’re watching your every move. We’re not telling you to kiss their boots, but don’t respond to a short attitude in kind. Stay polite and calm, and chances are they’ll begin to give you the same courtesy. More likely than not, the LEO will take a favorable or at worst, neutral, stance to your carried weapon. The individual writing these tips has been pulled over… a few times for a heavy pedal, a rush to a late game, or simply because of a busted tail light. Upon telling the LEOs that pulled him over that he was licensed and carrying a Springfield 1911, most of them smiled and quipped that they “prefer a Sig (or Glock”. He was courteous, honest, told them calmly, and gave respect. They gave respect in return and never even bothered to have him remove his weapon from the glove box. Will this be the case for you? From experiences, usually. Will you get a rude cop that acts apprehensive or even goes full crazy and places you in handcuffs? Unlikely, but possible. Either way, stay polite and calm. Interacting with cops when carrying and not landing in jail means knowing all the laws of the gun. For example, Federal Law says it’s illegal for one to carry a handgun in a school zone – that includes the public roads within 1,000 feet of said school. 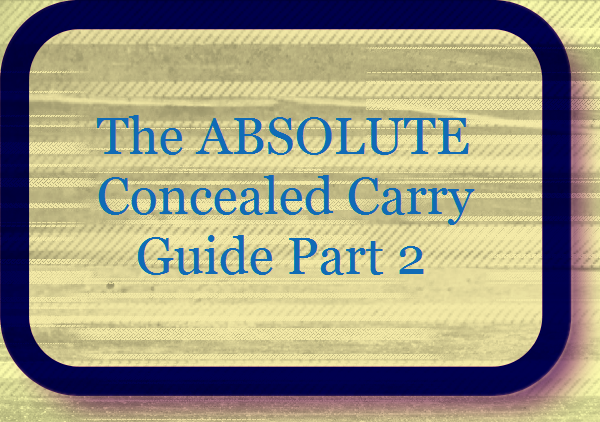 Are you legally able to carry in a restaurant, a bank, or a municipal building? Do you have a duty to inform before being asked if you’re carrying? Knowing the answers to these questions will keep you out of prison. Do not EVER say you shot to kill. You ONLY shot to eliminate the threat. Saying you shot to kill puts possible criminal intent against you with murder or manslaughter charges shortly following. Saying you shot to eliminate a threat keeps things on your side purely as self-defense. Anything else you tell law enforcement should be at the guidance of an attorney. When they arrive, they may arrest you. 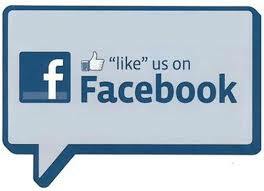 They will ask you a lot of questions. They will write down everything you tell them, word for word. Anything you say can and will be used against you in a court of law. Not for you. Against you. Tell them exactly what is referenced above: You shot in self-defense and you feared for your life, and nothing else. Remain calm and be polite. If you’re placed in cuffs, don’t react with anger or excessive emotion. That will be difficult, but it’s critical that you stay calm and collected. It’ll make your interactions with law enforcement smoother, and it’ll give them less to hold against you if they try to throw the book at you. Your firearm may be confiscated, and it might take a while to get it back – if ever. This is why an attorney is so important. They will help you navigate the legal maze you’ve found yourself in. In that first interaction, you’ll be alone.